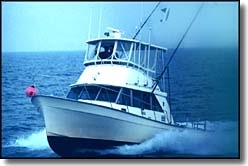 The Blue Fathoms is the finest scuba diving available in New Jersey. We specialize in comfort and safety, and cater to divers of all levels and abilities. The Blue Fathoms is a 35ft Henriques, custom fitted for the New Jersey Wreck Diver. The vessel features a heated/air-conditioned cabin, hot-shower, galley, state of the art electronics, and an experienced crew eager to lend personalized assistance and help you enjoy your diving experience.